i� Presseye Ltd- April 30th 2016, Danske Bank Premiership. 'Coleraine v Cliftonville, Coleraine Showgrounds'Coleraine's Neil McCafferty 'celebrates after scoring his second penalty to make it 3-0'during Saturday's match at the Showgrounds'Photo by TONY HENDRON/Presseye.com. Coleraine FC head into Friday night’s play-off determined to make a return to European football after a gap of over 10 years. Tha Bannsiders entertain Glentoran in the Europa League play-off semi final with Cliftonville waiting on the victors in a winner takes all showdown next Tuesday night at Solitude. 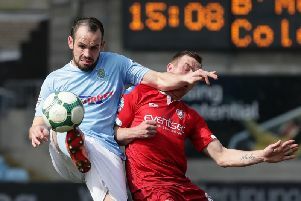 Oran Kearney’s men produced a terrific display to put the Reds to the sword on Saturday, and he has called on football fans from around the local get to get toThe Showgrounds on Friday night and inspire his side to more glory. “People need to realise we need a huge crowd out here on Friday night to get behind us. Home advantage is so important, it’s one of the things that could get us over the line on Friday night,” he told Times Sport. “I’d love the people of the whole borough and beyond to get out and get behind us. “All those guys who normally play on a Saturday too come along and show your support. “There’s something extra special about evening games I just hope we get a big turnout for it. “We’ve nothing to lose and everything to gain. “It’s not going to cost us anything if we don’t make it into Europe, but the rewards in a footballing sense, what it would do for that changing room to get away and experience a European trip would be fantastic. The Bannsiders have hit form at just the right time and Kearney praised his players for sticking with him as he managed the suqad over the last few weeks. “With my experience at school with Gaelic games I spoke to the lads and told them how we were going to approach this,” he said. “Some people were saying we hadn’t scored a goal in so many games, but I said to the lads to stick with me on it. “If we went into the Glentoran game having won the last five games it would still have no bearing on the game. “There’s no such thing as a good vein of form coming into a game like that. “It’s about making sure we’re ready for that game and we peak for it. “To be fair to the lads we have and each week we have stepped things up a notch. “The players understand the big picture. “It’s very hard to sustain that high energy and workrate every week, but can we do it for two games? Absolutely. “Our job is we do the best by the players and we leave them in a position to go and do that. “I think the way we’ve done that over the last four or five weeks and deflected all the negativity away from them. Ruaidhri Higgins is one of the few members of the current squad who had European experience, and he says belief is key to getting them through tese next two games. “I’ve been very fortunate to play a lot of games in Europe, I think it’s up near 20-odd,” he told Times Sport. “I was lucky when I broke into the team at Derry we were always up around the top end of the table and qualified for Europe most years. “For the young lads here it would be an unbelievable step in their career. “It comes down to belief at the end of the day. “We know we can beat anyone, but it’s about believing that every time you step out on to that pitch you can pick up three points. “I’ve played in poor team and I’ve played in good teams down the years, and I know we have a lot of real good talent in our changing room. “But as I say it’s about having the belief and hopefully come Friday night we can produce a performance to get us into the final of the play-off. “There wasn’t an awful lot riding on the game today and you can go and play with a free spirit. “There will be a lot more pressure on Friday night, no doubt about it, you lose you’re out, you win you’re in the final. “If you can handle the pressure better than your opponent, in my opinion, in these type of one off games, you’ll win the game. “You have to learn from your disappointments and try and turn it into a positive and have a word among ourselves to say that can’t happen again. Oran Kearney was pleased with his side’s showing against Cliftonville and says they are ‘bubbling’ at just the right time. “It was a very strong and promising performance, and that’s the way we wanted it going into these last two games,” he said. “After the game I told them I didn’t need to stand and tell them how good they were today, I know they know how good they were today and I know they know the level they need to be at on Friday night. “It’s about peaking at the right time. “There’s two games left this season and they have been the most important games for the last 10 or 12 weeks. “Nobody is going to remember us for beating Glentoran after the break, but they will remember us if we beat Glentoran on Friday night.